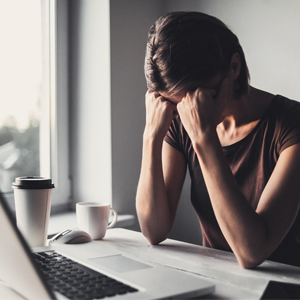 A recent study conducted by The South African Depression and Anxiety Group (SADAG) in partnership with Hexor, with the support of Lundbeck, indicates that depression affects one in four South African employees. People aged between 25 and 44 are most affected by depression and take more than 18 days per annum off work because of it. The IDEA study of the London School of Economics and Political Science 2016 says this costs the South African economy more than R232 billion (or 5.7% of the country’s GDP) as a result of lost productivity, either due to absenteeism or attempting to work while feeling depressed. Health24 previously quoted Dr Sebolelo Seape, chairperson of the Psychiatry Management Group, who said that more than 9.7% of the South African population (or 4.5 million to be exact) were suffering from depression. That means there's a good chance the person who sits next to you has had to cope with depression at some point in their lives. Given the shocking statistics, what should companies be doing to handle mental illness in the workplace? 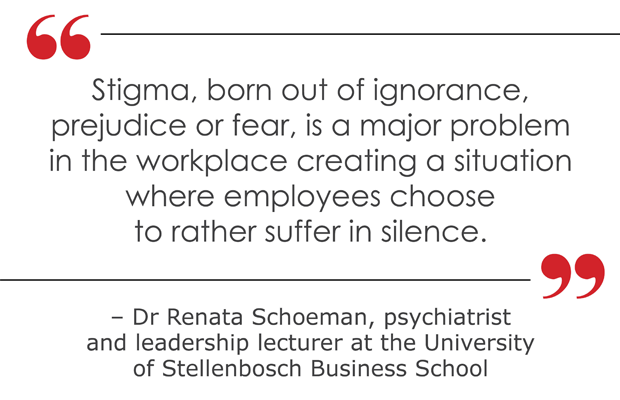 Psychiatrist and leadership lecturer at the University of Stellenbosch Business School (USB), Dr Renata Schoeman, says that more than 40% of all work-related illness is due to work-related stress, major depression, burnout and anxiety disorders. She recently presented at a Corporate Mental Health Awareness seminar at USB and said companies need to realise the significance their structure, expectations of employees and management style have on the company’s annual turnover, overall productivity and the risk of employees developing health problems that could prevent them temporarily or permanently reentering the workforce. Non-disclosure of depression as a reason for sick leave in the workplace often arises due to the stigma that comes with the condition. Employees also fear losing their jobs. In 2017 SADAG released stats following a survey to find out what the impact of mental illness has in the workplace. The results were shocking. 61% of respondents had disclosed their mental illness to their manager, with 69% of them saying they had experienced a negative or no response when they discussed the issue with them. 44% of respondents felt uncomfortable disclosing their mental health issue to their manager. “Undiagnosed and untreated mental health conditions directly impact a workplace through increased absenteeism and presenteeism (attending work while unwell), reduces productivity and increases costs. Most employers tend to completely underestimate the financial impact of mental illness on their bottom line,” Dr Schoeman said. She says it is imperative that companies understand the leading role they play in reducing or eradicating possible stressors at work. “[Companies] should foster a healthy educational environment with pro-active mental health awareness programmes, stress management training, access to services which nurture help-seeking behaviour, implement a coaching or counselling programme, identify people in need of care and offer them resources to ensure they receive proper treatment,” she said. Although policies and guidelines are necessary in the workplace, Dr Schoeman says that alone will not make a difference. Instead, companies need to foster a supportive culture of understanding and acceptance around mental illness. Dr Schoeman says mental health awareness in the workplace will ensure early identification and treatment of disorders, prevent recurrence and long-term complications. Implementing employee assistance programmes will help improve the quality of life for employees, while the longevity of the company will see a lesser loss to the country’s GDP and prevent disorders from becoming permanent disabilities.